Illus. with line drawings & Photos. Price: $29.95 $19.95 plus s&h. Cruising Sailboat Kinetics is a boat design handbook written for the everyday, non-professional sailor. It demystifies boat design terminology and concepts. It opens up for recreational sailors a new world of understanding why sailboats act the way they do. It explains how boat designers transform sailing dreams and abstract design criteria into today's sleek, functional three-dimensional craft. The first half of the book is a primer, a beginner's guide to design terminology and concepts, laced with photos and clear, non-technical illustrations. The second half of the book is a heavily illustrated showcase of the best cruising sailboat designs, including a lengthy explanation of what makes each design special. 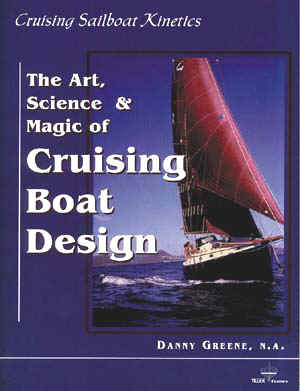 Author Danny Greene is a practicing naval architect and was the technical editor on the staff of Cruising World magazine, where he edited the "Designs" column for many years. Green lives aboard Brazen, a 32-foot cruising sailboat built to his own design, in Bermuda with his wife, Lisa, making periodic cruises to New England and the Caribbean. He has logged more than 50,000 cruising miles on a variety of boats, often sailing singlehanded. He has had considerable practical hands-on experience in all aspects of sailboat construction.